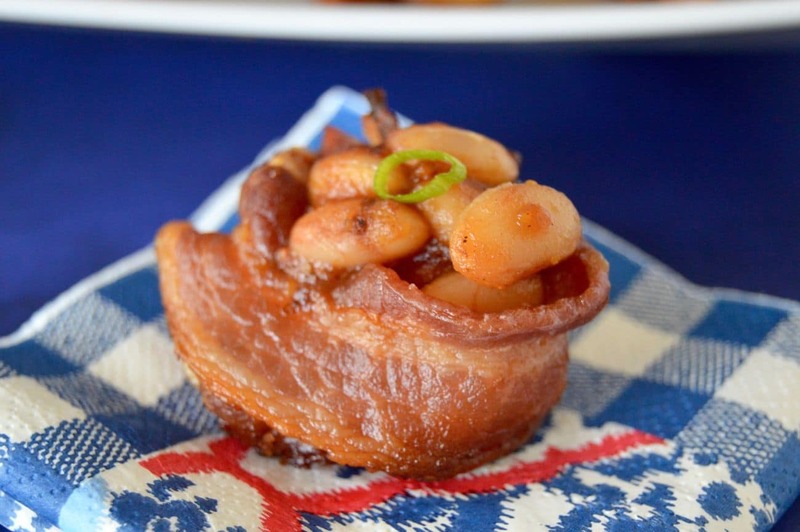 Baked Bean Bacon Cups are ideal for a big BBQ! Bite sized baked beans packed full of flavor served in individual servings of bacon cups! For those times you want to try everything, but don’t want to be so full afterwards you can’t move! I’m one of 50+ bloggers participating this week in CookoutWeek. All of us got together to give you lots of options for foods to take to a cookout this summer! 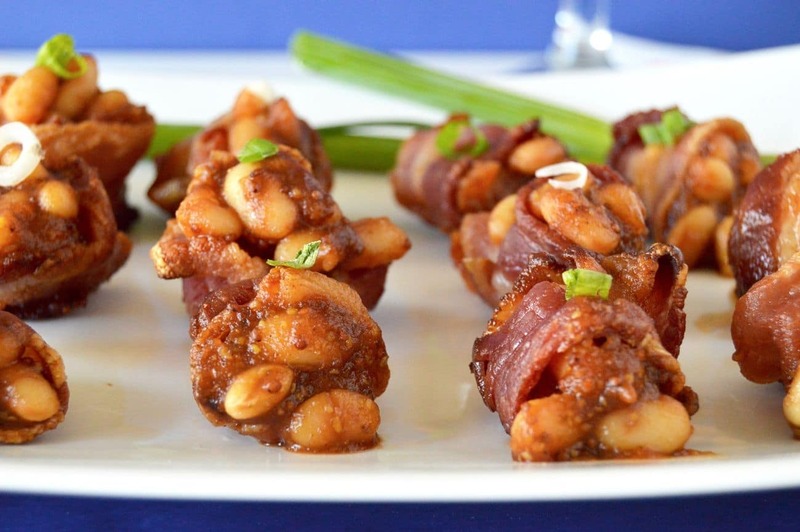 Today I’m sharing with you a recipe for Baked Bean Bacon Cups! I know I’ve kind of been on a cup/nest kind of mission lately. But its crazy how easy they are to make and how much everyone RAVES about them when I serve them! I love going to Cookouts/BBQ’s but sometimes I have a hard time showing restraint at trying all the different food options. These Baked Bean Bacon Cups are perfect because you can have the individual portions of baked beans (or 2,3 or 4 of them) and still have room for a bite or two of everything else! These baked beans are better for you than your normal baked beans because they are made with True Made Foods Ketchup. True Made Foods is one of the sponsors for the CookoutWeek and they sent their sauces over for me to come up with a recipe for. While they gave me the sauces I was able to try them for myself and I can honestly say they are very good. I love the fact they are made with real vegetables so they have real nutrition in them! Using the vegetables in their products allows them to forego all the added sugar that most sauces have in them. The vegetables sweeten them naturally so there is half the amount of sugar in them compared to the other brands on the market. Because of that my baked bean recipe is also better for you…. because I didn’t have to add any additional brown sugar to the mix! This recipe calls for using the Ketchup, but I also made a batch using their Veracha(aka hot) Sauce they sent too! It was pretty fantastic too! Easy/Hard: The recipe of the beans is as simple as mix it together heat and serve. 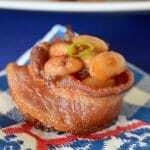 The Bacon cups require a little extra attention because you need to make sure that the bottom is secure enough that it will hold the baked beans. The more closely that it is “sealed” the better it is. A small opening isn’t the worst thing in the world to happen, but its much easier to eat (and way less messy) if it is sealed. Make Ahead? I made the baked beans and the bacon Cups the night before I wanted to serve them. I then assembled them and heated them up right before serving. I reheated the bacon cups up in the oven, but also tried putting them on a foil made tray and warmed then on the top shelf of my grill. That worked just as well. 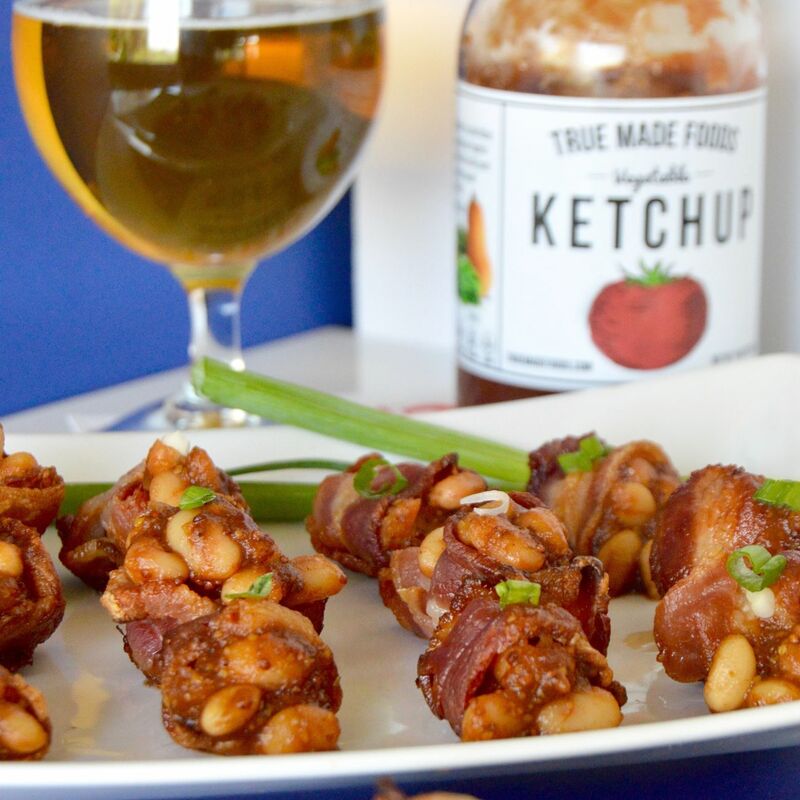 Baked Bean Bacon Cups are ideal for a big BBQ! Bite sized baked beans packed full of flavor served in individual servings of bacon cups! For those times you want to try everything, but don't want to be so full afterwards you can't move! Each slice of bacon will yield one "nest. Roll bacon to be 1/3 longer than it starts out as. The reason you buy thick cut bacon is because you are able to make it a longer piece, if you start with regular length bacon, the bacon becomes too thin and breaks in baking. Once rolled out, cut bacon into 2 pieces. Cut one piece that is 1/3 of the length, leaving a second piece that is 2/3 the length of the original piece. Starting on the bottom with the longer piece, place bacon over bottom, then wrap around the edges making a cup like shape. Fill in any gap at bottom with the second piece making the cup "sealed" (This is important so baked bean juices don't seep through. Bake for 20-30 minutes until bacon is crisp. Remove from pan, and allow to cool on a paper towel or parchment paper. Turn on stovetop to high, heat pan, once hot add bacon drippings/olive oill and swirl to cover the bottom. Reduce heat to medium high and add onions and cook until translucent. Add beans, True made Foods Ketchup, liquid smoke and Worcestershire Sauce . Cook for 20 minutes allowing for slight thickening and melding of flavor. Alternatively you can bake the beans for 20 minutes at 325. Once bacon cup has cooled slightly and crisped up, place 1-2 spoonfuls of bean mixture and serve on a platter. You can garnish with green onions, or cheese if you wish! If making the beans and bacon cups a day ahead, you will need to cool each completely and store separately in a sealed airtight container in the fridge until time to warm up. You can assemble them and bake at 325 until warmed through, about 15 -20 minutes before serving. Alternatively you can assemble them and make a foil tray to place them on your grill to warm them up. Place them on a shelf above the flame, or use indirect heat and grill until warmed through. Holy cow! THis is flipping brilliant…. what a great BBQ idea! Thanks so much! Oh my goodness … these are adorable! I love both bacon and baked beans, and I can only imagine how great these are together like this … thanks for sharing your recipe!